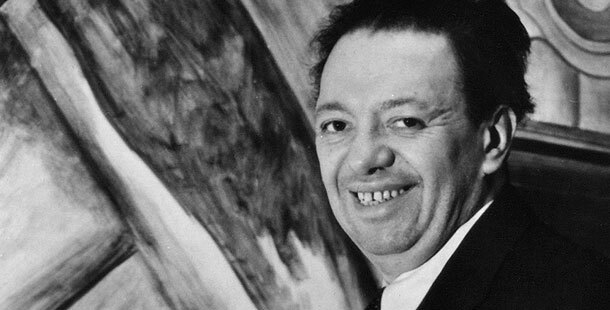 Considered the greatest Mexican painter of the twentieth century, Diego Rivera had a profound effect on the international art world. Among his many contributions, Rivera is credited with the reintroduction of fresco painting into modern art and architecture. His radical political views and tempestuous romance with the painter Frieda Kahlo were then, and remain today, a source of public intrigue. In a series of visits to America, from 1930 to 1940, Rivera brought his unique vision to public spaces and galleries, enlightening and inspiring artists and laymen alike. 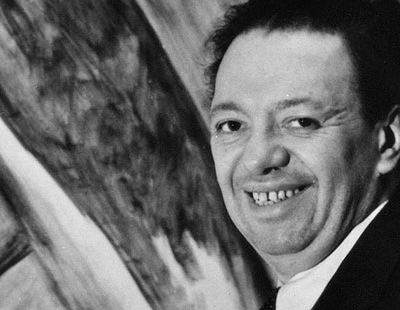 Diego Rivera was born in Guanajuato, Mexico in 1886. He began to study painting at an early age and in 1907 moved to Europe. Spending most of the next fourteen years in Paris, Rivera encountered the works of such great masters as Cézanne, Gauguin, Renoir, and Matisse. Rivera was searching for a new form of painting, one that could express the complexities of his day and still reach a wide audience. It was not until he began to study the Renaissance frescoes of Italy that he found his medium. It was with a vision of the future of the fresco and with a strong belief in public art that Rivera returned to Mexico. Frescoes are mural paintings done on fresh plaster. Using the fresco form in universities and other public buildings, Rivera was able to introduce his work into the everyday lives of the people. Rivera concerned himself primarily with the physical process of human development and the effects of technological progress. For him, the frescoes’ size and public accessibility was the perfect canvas on which to tackle the grand themes of the history and future of humanity. A life long Marxist, Rivera saw in this medium an antidote to the elite walls of galleries and museums. Throughout the twenties his fame grew with a number of large murals depicting scenes from Mexican history. His work appealed to the people’s interest in the history of technology and progress. The desire to understand progress was visible in the growing industrial societies of the 1930s, and Rivera saw the workers’ struggle as a symbol of the fragile political ground on which that capitalism trod. In 1930, Rivera made the first of a series of trips that would alter the course of American painting. In November of that year, Rivera began work on his first two major American commissions: for the American Stock Exchange Luncheon Club and for the California School of Fine Arts. These two pieces firmly but subtly incorporated Rivera’s radical politics, while maintaining a sense of simple historicity. One of Rivera’s greatest gifts was his ability to condense a complex historical subject (such as the history of California’s natural resources) down to its most essential parts. For Rivera, the foundation of history could be seen in the working class, whose lives were spent by war and industry in the name of progress. In these first two commissions and all of the American murals to follow, Rivera would investigate the struggles of the working class. In 1932, at the height of the Great Depression, Rivera arrived in Detroit, where, at the behest of Henry Ford, he began a paean to the American worker on the walls of the Detroit Institute of Arts. Completed in 1933, the piece depicted industrial life in the United States, concentrating on the car plant workers of Detroit. Rivera’s radical politics and independent nature had begun to draw criticism during his early years in America. Though the fresco was the focus of much controversy, Edsel Ford, Henry’s son, defended the work and it remains today Rivera’s most significant painting in America. Rivera, however, did not fare nearly so well in his association with the Rockefellers in New York City. In 1933 the Rockefellers commissioned Rivera to paint a mural for the lobby of the RCA building in Rockefeller Center. “Man at the Crossroads” was to depict the social, political, industrial, and scientific possibilities of the twentieth century. In the painting, Rivera included a scene of a giant May Day demonstration of workers marching with red banners. It was not the subject matter of the panel that inflamed the patrons, but the clear portrait of Lenin leading the demonstration. When Rivera refused to remove the portrait, he was ordered to stop and the painting was destroyed. That same year, Rivera used the money from the Rockefellers to create a mural for the Independent Labor Institute that had Lenin as its central figure. Rivera remained a central force in the development of a national art in Mexico throughout his life. In 1957, at the age of seventy, Rivera died in Mexico City. Perhaps one his greatest legacies, however, was his impact on America’s conception of public art. In depicting scenes of American life on public buildings, Rivera provided the first inspiration for Franklin Delano Roosevelt’s WPA program. Of the hundreds of American artists who would find work through the WPA, many continued on to address political concerns that had first been publicly presented by Rivera. Both his original painting style and the force of his ideas remain major influences on American painting.